Greg Rholl is Vice President of Business Development for Centrav. He began his career with Centrav 28 years ago and grew into a Business Development role. Greg came to Centrav with a B.S. in Marketing and a background in IT. 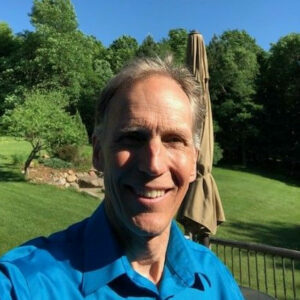 Greg interacts with the travel community extensively and still enjoys manning the booth at trade shows for Centrav where he gets the opportunity to meet and listen to travel advisors face-to-face. Greg strives to understand the travel agent’s ever-changing business model so that he can communicate that to Centrav’s IT department and help them improve the agent’s online booking experience at Centrav.com. Travel Research Online (TRO): How are you today, Greg? Greg Rholl (GR): I’m doing great, thanks! TRO: You’ve been with Centrav for 28 years. What is it about Centrav that keeps you working within the online air consolidation business? GR: The business itself is very interesting – multiple airline partners, an ever-changing environment, and the opportunity to meet and work with some really fun people…travel advisors! I choose to stay with Centrav because it is a great company that treats employees well, and it has a family culture designed to promote teamwork. I share the same basic values with the owners, who want to serve our customers well and also to give to people in need around the world. You can learn more about our give-back program at Venture.org, our non-profit arm that feeds orphans in Southeast Asia and supports girls in Nepal who are rescued from trafficking. TRO: Centrav has a new website design. Can you tell us about how it’s changed? GR: It is a complete rebuild from the ground up. Our first website was great and very popular, but it had become outdated. The new website has a modern look and is much easier to read. We incorporated all the great features from the old site into this rebuild and added about 40 new features that travel advisors have been asking for to meet their changing business model and needs. TRO: The travel industry is consistently evolving as the tastes for particular destinations and travel technology shift into the future. How does Centrav keep up with these changes? GR: Centrav sells only B2B and our website and customer service model are designed completely for that purpose using the input we have received from our travel agent customers. When I go to a trade show, I am as eager to listen to our customers as I am to tell them about my company. Any input they give me, or to our Customer Support Team, is gathered and analyzed to see how we can serve their needs for technology going forward. We constantly update the website with new features and review our customer service processes to see how we can offer better service. TRO: When flying yourself, what are your favorite destinations to visit? GR: Like a lot of Minnesotans, when I vacation I tend to favor warm weather destinations. I’ve traveled internationally a dozen times, and I find the diversity of other cultures to be really enjoyable and fascinating. Southeast Asia, India, Europe, Mexico, the Caribbean…it’s all good. I love Florida. But, my favorite destination right now happens to be the Dallas area where I am visiting my brand new grandson! TRO: For some of our newer readers, what would you say is the difference between searching for the deals yourself versus using a site like Centrav? GR: Centrav.com is a one-stop shop to see all airfares at once – international and domestic, consolidator fares and published fares. We offer discounted international airfares that are only available to travel advisors. You won’t find them on an OTA. This is a great opportunity for you to make money on air and still get a lower rate for your client. In addition, our website will offer you every published airfare in the GDS so you can literally book air anywhere to anywhere. Every fare we offer can be marked up for a profit. And, Centrav.com is designed for YOU, the professional travel advisor. The tools are carefully designed to facilitate your air sale. Our customer service team takes care of the headaches of selling air so you can focus on your client instead of wasting time sitting on hold with an airline over a schedule change. TRO: Besides Centrav’s new and improved site, are there any other plans for the near future? GR: The new website gave us the foundation we needed for the future. We are already working on Phase II, which will provide some exciting new features on a larger scale. I’ll have to keep the details close to my vest for now, but be assured we will let everyone know when we are ready. TRO: Thank you for your time, Greg. GR: And thank you as well. I appreciate the opportunity!